Once inaccessible to many organizations, today’s renewable energy technologies make financial sense and companies are paying close attention. TAEBC member Schneider Electric partnered with GreenBiz Research to release the State of Corporate Energy & Sustainability Programs 2018 report. The findings are based on responses to an online survey completed by 236 energy and sustainability professionals representing diverse industries and companies, with $100 million to $10 billion or more in annual revenue. Getting close to those projections requires widespread support from the business community, and the report shows that support exists. Companies are helping cut emissions en masse by shifting to more clean, sustainable resources. A majority of respondents reported having renewable energy projects underway or planned. And the rate topped 60 percent in four sectors: education, health care, financial services and technology. Even the sector with the least amount of traction (industrial) still reported a respectable 39 percent adoption rate. The movement toward renewables is likely due to C-level interest and support. Whether their role involves recommending, reviewing or approving projects, 82 percent reported being involved at some level in sustainability and renewable energy initiatives. The impact on businesses is substantial because renewable energy projects help meet sustainability goals, build a stronger brand and benefit the bottom line. A recent study found that 72 percent of companies are pursuing renewable energy procurement, and 80 percent plan to build out their renewables portfolio via multiple types of transactions, such as offsite power purchase agreements and onsite generation. It’s also important to mention financial return on investment has always been the obvious benchmark for energy and sustainability initiatives, but other criteria are now being widely considered. When asked about primary drivers for energy and sustainability efforts, cost savings was most often selected, 69 percent of the time, as one of the top three objectives. But other factors garnered high rates as well. Meeting internal and external goals ranked second (60 percent), and nearly half cited improving company brand, as well as mitigating environmental risks. This week TAEBC is highlighting mentor Harvey Abouelata. He serves as the President of ARiES Energy. Harvey has worked on a variety of renewable energy projects for Wampler’s Farm Sausage and most recently a 1.37 MW solar installation for Appalachian Electric Coop – the first utility-scale community solar project in the state – which was officially unveiled in early January. He also has extensive experience in business management, business planning, strategy, sales, marketing, promotions, public relations, and new technology brand identity with concentration in the renewable energy field. While being involved in the solar industry, he has succeeded in bringing millions of dollars in grants to local companies and the State of Tennessee. At ARiES, he oversees business operations and management, marketing strategy, and overall customer satisfaction. 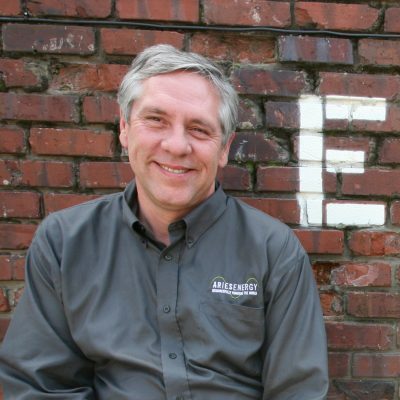 In recent history, Harvey was the Vice President of Sales and Marketing at a privately owned Knoxville company where he oversaw the sales, product development, and marketing of residential and commercial products and services for solar PV and thermal design. Prior to this position, he was the Director of Sales and Marketing for another renewable energy company launch. Since graduating from Rochester Institute of Technology in 1984, he has been helping businesses launch, reorganize, and bring new technologies to market. Harvey excels at setting up successful sales, marketing, business plans and economic development strategies for companies, as well as executing public outreach and education. TAEBC is still accepting mentors for the Energy Mentor Program. If you are interested in this opportunity, please visit the “For Mentors” section of the Energy Mentor Network portion of TAEBC’s website. The Tennessee Department of Environment and Conservation (TDEC) is inviting Tennesseans to submit nominations for the 2017 Governor’s Environmental Stewardship Awards. These awards include ten unique categories: Building Green, Clean Air, Energy and Renewable Resources, Environmental Education and Outreach, Environmental Education and Outreach (school category), Land Use, Materials Management, Natural Heritage, Sustainable Performance, and Lifetime Achievement. Any individual, business, organization, educational institution, or agency is eligible to apply provided it is located in Tennessee and the project was completed during the 2016 calendar year. All nominees must have a minimum of three consecutive years of overall environmental compliance with TDEC. Self-nominations are encouraged. The awards are designed to bring about a greater knowledge and awareness of effective practices and projects and to give proper recognition to those persons and organizations that make outstanding contributions to the natural resources of their community and the state. The awards also promote leadership by example in order to increase promotion, protection, and conservation of the natural resources of the State of Tennessee and its wildlife, forests, soils, air, water, natural heritage, parks, and recreation. A panel of judges representing agricultural, conservation, forestry, environmental, and academic professionals will select award recipients based on criteria including level of project or program completion, innovation, and public education. The deadline for nominations is March 31, 2017. Award recipients will be announced in May 2017. 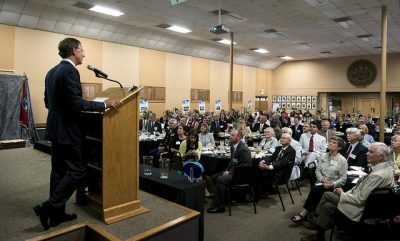 The Tennessee’s Governor’s Environmental Stewardship Awards are the most prestigious environmental and conservation awards in the state. For more than 30 years, the awards have been presented to individuals and organizations making significant contributions to the protection and improvement of our natural resources and wildlife. For more information about each category, judging criteria, and nomination forms visit TDEC’s website. Click here for a link to the original story written by Chattanoogan.com. Earlier this month a new report, 2016 Corporate Advanced Energy Commitments, explained renewable energy demand is “significant and growing quickly” within Fortune 100 and Fortune 500 companies. Its findings reveal that 71 of Fortune 100 companies and 215 of Fortune 500 companies have set renewable energy or sustainability targets. TAEBC decided to take a closer look at which companies in Tennessee not only made the list but also have set energy goals within their corporations. It’s important to mention 22 companies in the Fortune 500 list have committed to 100% renewable energy including General Motors and Nike. General Motors has a plant located in Spring Hill, Tennessee and recently announced plans to add 650 jobs there. Meanwhile, Nike’s largest distribution center is located in Memphis, Tennessee. Coming in at the highest ranked Tennessee headquartered company on the list is FedEx Corp. FedEx’s corporate office is located in Memphis. It’s been on the list for more than 20 years and employs more than 323,000 people nationwide. The company has made impressive gains in meeting and exceeding these goals. In FY12, FedEx achieved a 22% fuel efficiency improvement in the FedEx Express vehicle fleet since FY05. It also happily announced that FedEx Express increased its previously stated vehicle fuel efficiency goal by 50% to a 30% improvement by 2020, still using FY05 as the baseline year. By the end of FY12, FedEx Express had increased its global electric vehicle and hybrid-electric vehicle fleet to 482 vehicles, an increase of nearly 18%. As of December 2012, these vehicles had logged 14.8 million miles and saved 480,000 gallons of fuel since being introduced to its fleet in 2005. The other Tennessee company making it to the Fortune 100 list is HCA Holdings, Inc. HCA Holdings’s corporate office is in Nashville. It’s the nation’s largest hospital chain and its revenues rose 8.7% over the past year. The magazine credits this to the passing of the Affordable Care Act, increasing its number of insured patients seeking healthcare. HCA Holdings, Inc. has been on Fortune’s list for at least 22 years. The company employs more than 200,000 workers. Pursuit of LEED Status – Several of HCA’s hospitals have received LEED Certified status or are in the final stages of such including it’s Nashville Data Center. Alternative Energy Sources – Solar, wind, and combined heat and power energy systems can be incorporated into new construction. HCA’s Sustainability Plan says “an evaluation of the feasibility of these systems will occur for all future projects. As the Tennessee Advanced Energy Business Council’s Economic Impact Report foretold in 2015, the advanced energy sector has but one direction to move in and that’s up. 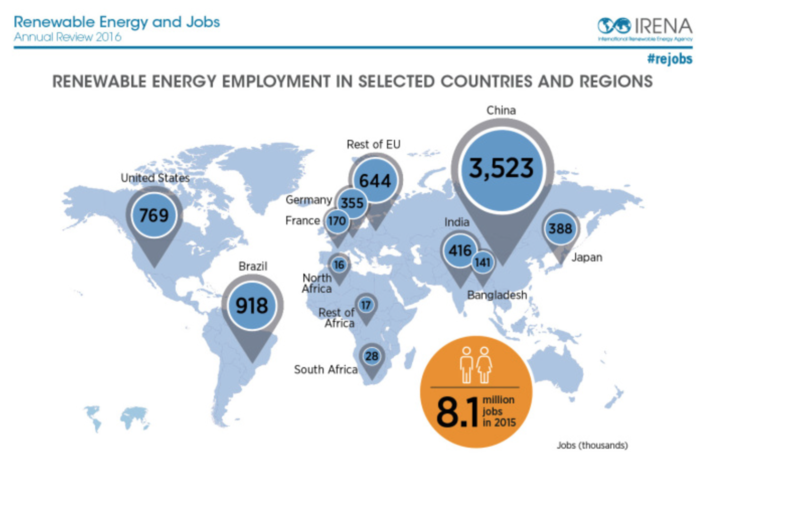 A recent report released by the International Renewable Energy Agency – the Renewable Energy and Jobs Annual Review 2016 – shows that more than 8.1 million people worldwide are working in the global renewable energy industry. Renewables are one part of the advanced energy sector, but a growing sector at that. And, in the U.S., for the first time jobs in solar energy overtook those in oil and natural gas extraction, helping drive a global surge in employment in the clean-energy business as fossil fuel companies began experiencing shaky ground. U.S. solar business grew 12 times faster than overall job creation. Solar jobs are bolstered by state initiatives to spur clean energy development, leading to employers adding workers at record rates to install rooftop panels. In contrast, oil and gas producers have slashed 351,410 jobs worldwide since prices began to slide in the middle of 2014. Globally, the workforce in clean energy is expected to grow to 24 million by 2030, if targets on climate change and development are met. What does this translate to locally in Tennessee and the Southeast? Tennessee, rich in advanced energy resources, is poised to continue rapidly expanding upon the nearly 325,00 advanced energy jobs, supported by more than 17,000 firms within the state. As TAEBC Charter members and research assets, Oak Ridge National Laboratory and the University of Tennessee, along with private sector innovators continue to research, develop and produce new ways to meet energy demands, Tennessee will undoubtedly lead the new energy economy. The TAEBC Economic Impact Report showed that advanced energy requires skilled workers, serving as a primary source for high quality jobs. Manufacturers benefit from a robust advanced energy sector while advanced energy contributes significantly to state and local economies. Tennessee is well-positioned to keep pace with the international trend, serving as a key contributor to a booming global advanced energy economy.